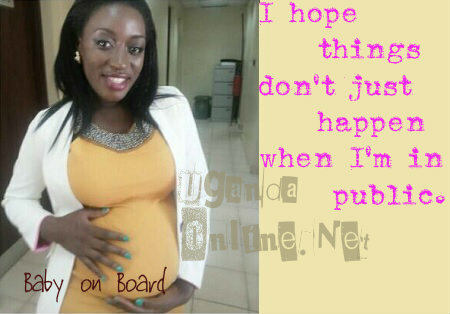 Ex Life Stories host, Justine Nameere is due to give birth to her first child. Amazingly, even Zuena Kirema who took on the role of Life Stories host is also expecting her fourth child with hubby, Bebe Cool. "Thanks to God for giving me the energy and strength. I have worked throughout my pregnancy; school; field; meetings; travel; comfortably..... but now am worried. I hope things don't just happen when I'm in public.... hehehe." The above statement just confirms that the count down is on...Justine joins other pregnant mom's that are due to give birth or expecting like Barbie Kyagulanyi, Jackie Obsessions, Empress and Zari Hassan Dangote. "When you reach 38 weeks make sure u have packed all de necessary things and move around with them together with your hospital folder if they give one in Uganda and don't forget to breathe through the contractions.." a close pal advised. When her first pregnant shot leaked in May, folks were asking who the lucky guy was but Justine just told them to keep watching that space, they will eventually get to know.